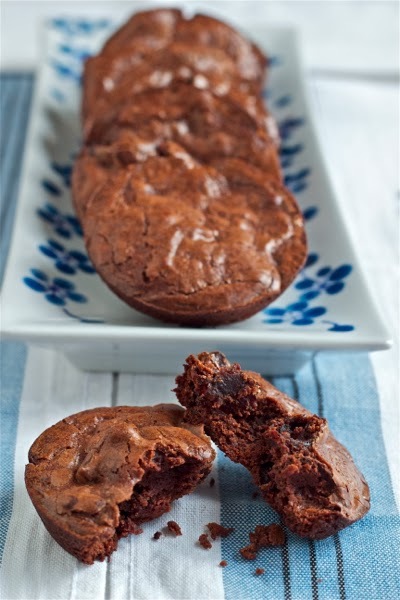 These brownies are extra rich and really quite decadent. Very adult brownies that I would have no compunction serving as a dinner party dessert, topped with a small dollop of fresh whipped creme or roasted cherry jam. But they also make a great mid-day snack or adult lunchbox treat. Way better than cookies. Not that I'm slamming cookies. I mean, 'tis the season for breaking out all the killah cookie recipes -- and I will definitely have some knock-your-socks-off new ones for you next week. 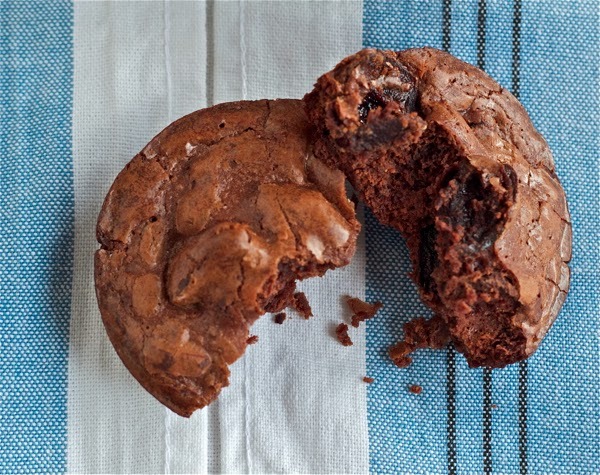 But just for now, let's focus on the cute, decadent round brownies, shall we? Feel free to substitute dried cranberries for the cherries, if you prefer. Heat the port and water to boiling in a small saucepan and then add the cherries. Immediately reduce the heat to low and stir until the majority of the liquid has evaporated. Remove from the heat and cool. In a heat-safe bowl set over a pot of simmering water, melt the chocolate and the butter, stirring until smooth. Remove the bowl from the heat and whisk in the sugar, followed by the eggs (one at a time) and then the salt and pepper. 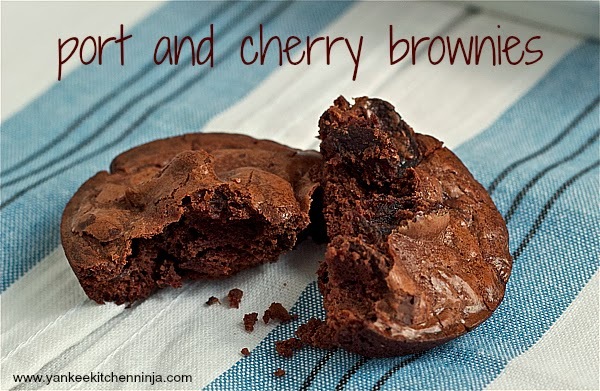 Stir in the flour and then gently fold in the cherries (plus any remaining liquid). Divide the batter evenly among 24 greased muffin tins. Bake for about 20 minutes or until an inserted toothpick comes out clean. Cool the brownies in the tins to room temperature and then unmold. These sound amazing and I love the portion control! Hahaha I'm so with you with being bombarded with the crap pile of emails! This definitely is a diamond in the rough! And I'm totally stealing that idea of using a muffin tray for the brownies. Such a great idea!